Zoran Jankovic with one of his patients. Homeopathic medicine is increasingly gaining popularity as an alternative or complementary treatment to conventional medicine. Stephanie Fsadni gets to grips with its basic principles and why it can work on pets as much as on humans. Homeopathic medicine is increasingly becoming popular among local pet owners. 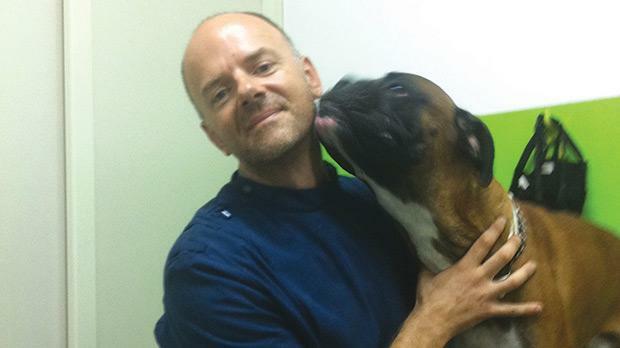 Veterinary surgeon Zoran Jankovic can attest to this fact and to the benefits of homeopathy, which he describes as “a sophisticated medical system aimed at complete restoration of health and prevention of recurrence”. “At this perilous time in our civilisation development, when it is essential to utilise practices that strengthen the immune and defence system, homeopathic medicine is quite naturally gaining popularity,” says Jankovic. He explains that, contrary to ‘traditional’ or conventional medicine – which normally uses substances that have the opposite, suppressive or extinguishing effect on a causative agent, disease process or symptom – the fundamental principle of homeopathy is the similarity principle or “let like be cured with like”. Research has shown that rather than a drug having increased effects as the dose is increased, the opposite is true: the larger the dose, the more reduced the effect. And exceedingly small doses of the same drug will actually increase its effectiveness. One of the fundamental tenets of homeopathy is that it does not treat disease, but a patient – human or pet – with disease. The medicines are prepared in laboratories of specialised pharmacies. There is no such laboratory in Malta, so Jankovic obtains his stock from overseas, mostly the UK and Germany. In some countries, homeopathic remedies are available off the shelf, however, he warns that these should be prescribed by veterinary professionals. He laments that nowadays many products are “falsely sold” as homeopathic in pharmacies and health food stores and that many people believe that any medicine sold as a herb must be homeopathic. Homeopathic medicines are normally given orally in the form of tablets, granules, pills or dissolved in water. In the conventional approach, drugs are expected to act on particular tissues or organs. When several organs are affected in chronic disease, symptoms are addressed by a number of drugs given in a mixture. • It must be based on the totality of the symptoms, including mental and emotional symptoms, not just physical. • It must be a single remedy, never a mixture. • It can never be administered in a substantial dose. When asked what happens if a remedy does not work, the vet is quick to point out that the same could happen with conventional medicine. “What if the antibiotic your doctor prescribed doesn’t work? He or she prescribes a stronger one. If the homeopathic medicine does not work, there is usually a problem with the prescribing process,” he says. As a practitioner of integrative veterinary medicine, Jankovic gives special attention to diets. Jankovic claims that most of the official nutritional advice for humans or animals is driven by economic interest and big corporations. “In an effort to fit animals into our modern lifestyle, we have forgotten the basic natural fact – dogs and cats are carnivores. Feeding them highly-processed food based on complex carbohydrates is a sure recipe for a health disaster. These days, obesity, diabetes, liver and kidney failure have become rampant in older pet animals. Jankovic is positive about the effectiveness of homeopathy. He refers to Hahnemann, credited with creating homeopathy, who based his laws on experiment and observation. For more information, visit http://vetmalta.com . • The fundamental principle of homeopathy is the Similarity (or Similia) Principle: Similia similibus curentur (let like be cured by like) stated by German physician Samuel Hahnemann (1755-1843). • One of the fundamental tenets of homeopathy is not to treat a disease, but a patient with disease. • Homeopathic medicines are prescribed to aid the organism in its highly sophisticated efforts to heal. • Homeopathy follows a principle in pharmacology, called the ‘biphasic response of drugs’, which says that rather than a drug having increased effects as the dose is increased, the opposite is true: the larger the does, the lesser the effect, while extremely small doses of the same drug will actually increase its effectiveness. • Homeopathic preparations should be prescribed by professionals with sound knowledge of homeopathic principles or by qualified homeopaths.